Credit: www.livingroomconversations.org. All rights reserved. There we sat: a Christian pastor, a Catholic, a Mormon and three atheists – six people with opposing views about hot topics in American politics. How did the room feel? Energized - no yelling, some laughter, lots of listening and a whole bunch of questions. But so what? Why is this scene even worth a mention? In the pervasive political hostility of contemporary America, many people have resigned themselves to accept that permanent division - an ongoing absence of productive conversation across political divides - is just the way things are. And little wonder. It's hard to find any venues these days in which those with different social and political views can actually meet each other, at least for anything other than head-on confrontation or festering mutual suspicion. When you combine the power dynamics involved, the media magnification of conflicts and the underlying influence of moneyed interests, it's difficult to imagine anything really changing between political opponents. Until, that is, you sit with them in your own living room, bedroom, kitchen or whatever space you happen to have available. In cases where one system has become too powerful, community psychologists have long championed a subtle yet powerful strategy for social change. It’s called the "creation of alternative settings," broadly defined as "any instance in which two or more people come together in new and sustained relationships to attain their stated objectives." This can mean many things, of course: new community organizations, innovative agencies, or grand political compromises. But in recent years, small groups of people have been coming together around an even simpler idea: rather than learning about political opponents from a critic on TV, how about listening - really listening - to real-life neighbors or acquaintances that embody these views in practice? It's a simple idea, but potentially quite radical, and it's catching on. Since 1992 for example, the Jewish–Palestinian Living Room Dialogue has been taking place in California, sparking parallel initiatives all over the world. 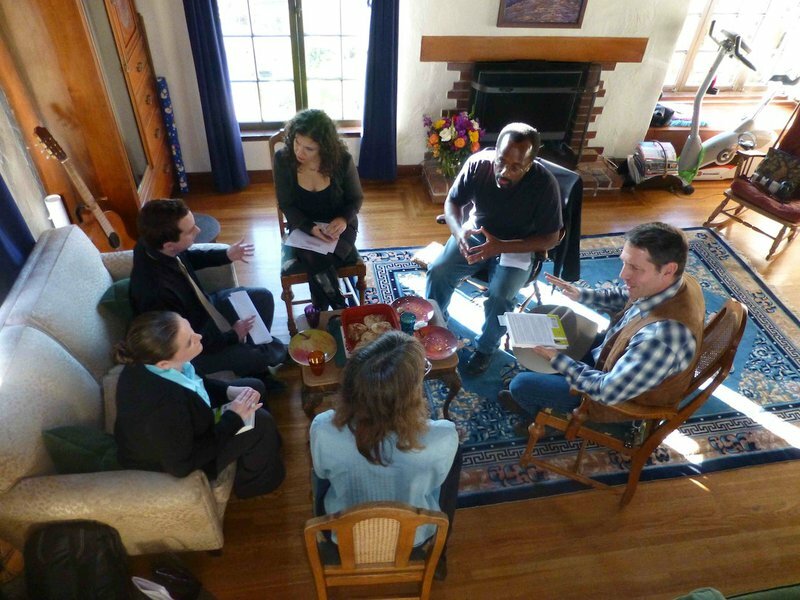 More recently, an organization called Living Room Conversations has begun to convene diverse clusters of neighbors for respectful engagement across a host of challenging topics. To date, conversations about “crony capitalism,” immigration, mental health, money in politics, voting, gay marriage, the role of government and energy policy have taken place, and many more are planned. Two friends with differing views agree to co-host a conversation about a subject on which they disagree. Each co-host then invites two other friends to join them. Those attending agree to six simple ground rules that are designed to ensure respectful listening, relationship building and a discovery of potential common ground. No training is needed - just some friendship and a bit of trust - but obviously things are rarely that simple. One problem is simply the accelerating pace of life, which continues to squeeze out time for conversation and community building. According to a survey released in August 2013, for example, the total amount of time that Americans spend on using media of all kinds has risen to 11.52 hours per day. For digital media the figure rose from 3.14 hours in 2010 to 5.09 hours three years later – mostly spent on smart phones and computers. Increasingly, we interact with screens rather than with real people in our lives, and social media tend to attract like-minded users to blogs and websites whose content they agree with. In parallel to this shift in communications, venues that used to provide meeting grounds for people of different social and political views have declined dramatically in the USA since World War Two – like schools and the national federation of Parent-Teacher Associations, other cross-class mass-membership groups, and non-profit organizations which increasingly act as service-providers rather than as schools for democracy. As these settings have become endangered and in some cases, extinct, it has become surprisingly difficult to find spaces for debate that are genuinely diverse so that no-one is left out. In this vacuum, the most privileged are left to dominate and speak for others. That’s why Living Room Conversations are such a radical act in contemporary culture: to lay aside the screens, at least for a while; to allow yourself to sit with other human beings who you know differ from yourself in fundamental ways; and then to ask some questions, and hear what the other person really thinks. This kind of non-violent or compassionate communication can foster feelings of connection, understanding and empathy between diverse citizens. By revitalizing a different form of political conversation, it might even be able to generate new ripples of culture change. But there’s a big question lurking in the background: can something like this really make a difference? Does what happens in people’s conversations matter in the wider world of politics? To the surprise of many, in 2009 the Mormon Church publicly announced their support for a proposed Salt Lake City ordinance aimed at protecting LGBTQ residents from discrimination in housing and employment. What lay behind this action? When church officials and LGBTQ leaders decided to hold a series of private meetings, they first considered the Church Office Building, then a coffee shop at the Utah Pride Center, and eventually settled on a neutral location - the living room of a couple in downtown Salt Lake City who had ties to both communities. Mutual suspicion was rife in their first few meetings: "These were two communities living in the same town that just had no understanding of each other" said Jim Dabakis, a gay man who was acting chair of the local Democratic party. We often assume that solutions to big problems must be complex and expensive. But is that always true? "By small and simple things," as Alma in the Book of Mormon puts it, "great things are brought to pass." Although sitting together in a living room or a kitchen may not sound like the stuff of transformation, what if larger collaborations and grander compromises depend on smaller ones? What if hearts need to change in order for other shifts to take place? Call us crazy - but we believe that what happens in a simple conversation such as this could really make a difference. If so, what would happen if millions of citizens began to engage in this same, potentially radical act?